Of course, when you are in the market for blinds or shutters, you will want them to look the part, serve the essential practical requirements that you have for them, and last for many years. Sure enough, we’ve worked hard to source the broadest range of products to suit what may be your very specific needs, encompassing Seattle shutters, Georgia shutters, vertical blinds, Venetian blinds, Hollywood shutters and so many more chic and appealing options for every room of your home. However, there’s also something very different about how we conduct ourselves here at All Kent Shutters and Blinds, compared to other blind and shutter specialists. We don’t use a salesperson, so you won’t be confronted with pushy sales tactics. Instead, we’ll simply concentrate on giving you the complete bespoke measuring and installation service. Indeed, our expert surveyor has more than 20 years’ experience in the measuring, fitting and installation of blinds, and creates the bespoke and made-to-measure products that you might never have expected from a company offering shutters and blinds at our price point. A five-year guarantee is also provided on all work. Whatever you intend to do in or out of your home this spring, it would be great to be able to have some new, good-quality shutters and blinds installed that look amazing and can be used straight away to control the amount of heat and light that comes into your property. 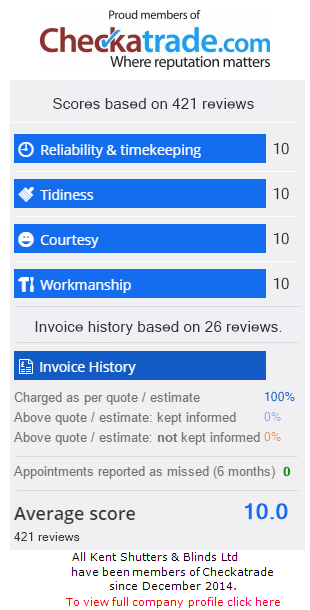 We refuse to be beaten on price here at All Kent Shutters and Blinds, so don’t hesitate to get in touch with our team now to request your free quote.